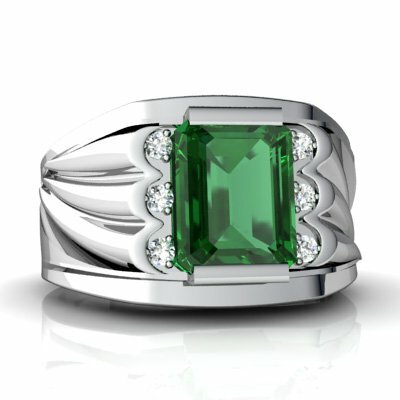 Men's emerald rings are a clear signal of courage, sophistication, yet care, love and style. See what to look out for and how to spot a fake before buying your vintage emerald ring for self or your man. You will be able to raise queries and leave reviews on this fine men jewellery. 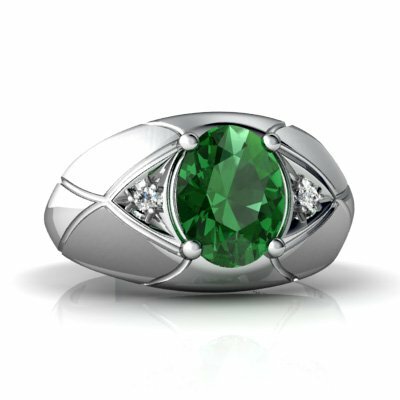 Why men's emerald rings? Emeralds are one of the finest and most fascinating gemstones. 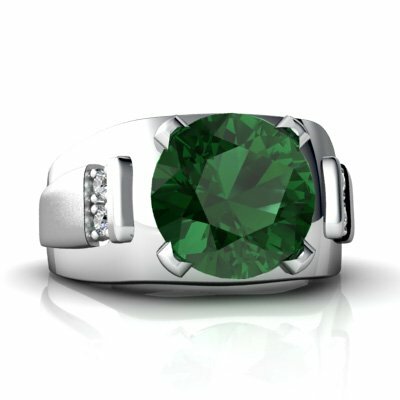 Their beautiful, intense and radiant green make men's emerald rings a prized possession for many men all over the world. Inclusions, or flaws are tolerated, and very fine, top quality emeralds can be valued higher than diamonds of the same carat. It is your way of expressing infallible courage, sophistication, honesty, male purity, love and tranquility. Believed by the ancients to have a huge healing power, protecting the bride and preserving chastity, as well as bringing lovers closer, emerald still finds a great place in the hearts of men and women looking to express their individuality in a fine way. The word emerald originates from the Greek “smaragdos”, which translates to the Old French word “esmeralde”, or “green gemstone”. This wonderful gem has had a prominent place in valuable collections for centuries. The Aztecs and Incas regarded emeralds as holy. The finest emeralds come from Colombia - from the Coscueze, Gachala and Muzo mines. Possibly the oldest known emerald deposits were found in Egypt, near the Red Sea. these mines, which became known as "Cleopatra's Mines", date back to about 3000BC. However, by the time were rediscovered at the beginning of the 19th century, they had already been exhausted. Ancient Indian holy scriptures, the Vedas, mention precious green gems with amazing healing powers and the promise of good luck. Indian maharajas and maharanis treasure chests were found filled with brilliant emeralds. One of the largest emeralds in the world, named the “Mogul Emerald”, has been dated to 1695, is 10 cm tall and weighs about 217 carats. One side of the gem is inscribed with prayer texts, and the other side has engravings of marvelous floral ornaments. On Sept. 28, 2001 this legendary gem became part of a private collection when an unidentified buyer bought it at an auction held by Christie's of London for 2.2 million US Dollars. 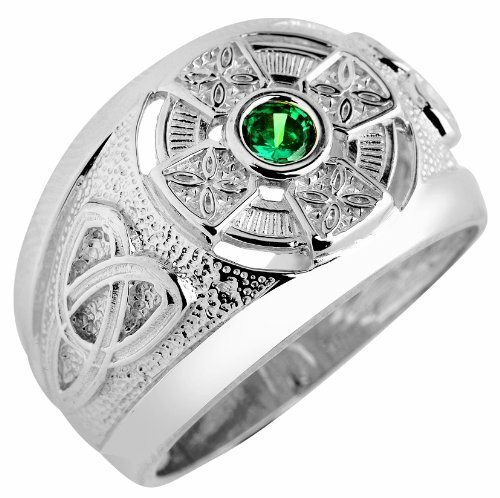 Obviously men's emerald rings have been popular for centuries and have an illustrious history. The New York Museum of Natural History is home to a pure emerald cup, once belonging to the Emperor Jahangir which is displayed next to “Patricia”, a large, 632 carat Colombian emerald. The Bank of Bogota collection includes huge emeralds weighing between 220 and 1796 carats. Many valuable emeralds are housed in The Iranian National Treasury. Green is considered the color of new life and springtime. But, for centuries it has also been the color of constant love and beauty. In ancient Rome, the colour of Venus, the goddess of love and beauty was green. And this color still holds a special position today in many religions and cultures. For example, green is the holy colour of Islam. As a symbol of faith and unity, many states of the Arab League have the colour green in their flags. The Catholic Church regards green as the most natural and elemental colour of worship services. Even though the good hardness of the emerald protects it to a large extent from being easily scratched, its brittleness and numerous fissures present problems when cutting, setting and cleaning. Highly skilled gem cutters are often challenged. In the first place, a bad cut could destroy the high value of the raw stones, and secondly because of the many inclusions. This, however, does not dampen the love and awe a cutter feels for this unique gem. These challenges led to the creation of the famous emerald cut. The clean, rectangular or square design with bevelled corners fully brings out the beauty of this remarkable jewel, while at the same time providing protection from mechanical strain. 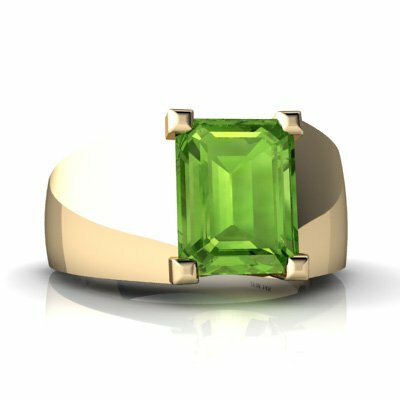 Of course, emeralds are also cut in many classical shapes, so you are sure to find the perfect men's emerald rings to suit your personal style. If the raw crystal contains too many inclusions, the emerald cutter may gently round the edges or cut it into a delicate emerald bead, which is a highly popular design in India. These days many emeralds are enhanced with clear oils or resins. Although this is widely practiced throughout the trade, there are some consequences as the gems may have adverse reactions to certain treatments. For example, you cannot have them cleaned in an ultrasonic bath. Some of the substances used by the cutter, or applied after wards, were to seal the fine surface pores of the gem. If this is removed, your beautiful men's emerald ring will end up looking matte. You should always take your emerald ring off before putting your hands into water with cleaning solutions. Unfortunately, the beauty and high value of emeralds make them a target for fakes. 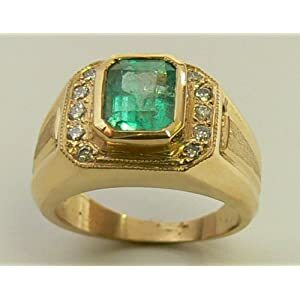 The best way to make sure the men's emerald rings you are buying are the real deal is by shopping at a reputable dealer, preferably a specialist you know you can trust. Be particularly cautious of extra large gems. Only buy these if they have a certificate of authenticity from a reputable gemmological institute. Thanks to modern technology, these institutions are able to differentiate between natural and synthetic emeralds. The certificate will also tell you if the gem has been subject to any special treatments you should know about. Another thing to keep in mind when hunting for the perfect men's emerald rings is that emeralds below 1 carat do not really show their beautiful glow. Other than that, the size of your emerald is purely a matter of personal taste. Found the perfect man's emerals ring you think everybody should know about? Write a review for Diamonds-to-Pearls.com and share it with other lovers of beauty.